Dragon Ball Z is getting its continued anime revivals with the original creator Akira Toriyama actively involved. 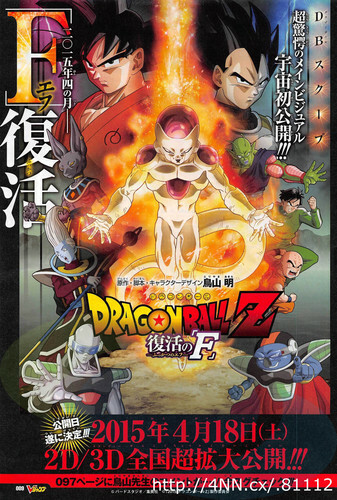 The next movie has been announced: Dragon Ball Z: Fukkatsu no F, due out April 18, 2015 in Japan. The title refers to the Japanese word for resurrection, fukkatsu, and also Frieza, the most iconic villain from the long-running series. It sounds like someone is wishing him back to life, and somehow Beerus, the antagonist from the previous film, will be involved, as he is on the poster. While I’m interested in seeing Frieza come back, it’s going to be a challenge to make him menacing again without only relying on some increase to his “power level.” After his initial defeat, his subsequent appearances resulted in embarrassing further defeats. Hopefully they find something interesting to do with him.